It has been an incredible week so far. Meeting University of Auckland students, participating in their Kapahaka class, and visiting the War Memorial Museum are only some of the many great activities of the week. But my favorite event thus far has been being allowed to participate in the Tikanga Rangahau Wānanga Series, a two-day conference event held at Fale Pasifika at the University of Auckland, where Māori researchers and scholars share their knowledge and expertise concerning Māori research and its importance. I personally attended Professor Jenny Lee-Morgan’s seminar Pūrākau as Methodology, which centered around the idea of combining Pūrākau, or storytelling, with pedagogy to create dynamic, Māori based education. Ever since arriving in Aoteroa, I’ve been continually amazed by the resiliency of its Indigenous peoples. Though the lasting presence of colonization remains evident in the everyday lives of modern day Māori, the continued strength displayed by the peoples is undeniable. Over the past few days I’ve been able to reflect on how this is even possible; and the greatest commonality I’ve realized amongst the various Indigenous communities we’ve encountered is simple: the relevancy of storytelling. The Fale Pasifika building where the conference was held. It is unbelievable, the ability for an entire culture to survive simply in knowing it has many times before. According to Professor Lee-Morgan however, storytelling is not simply a tool for survival, but could also prove vital in classrooms and research. Utilizing Māori stories in education not only create dynamic discourse, but also provide a means for shaping research and education from a Māori worldview. One of the greatest ambitions of colonists was to destroy the Indigenous lens until the only worldview that existed was their own. In doing so, they not only robbed future Māori communities of perceiving the world as their ancestors did, but also made it nearly impossible for these oppressed people ever truly be sovereign again. Māori have made it clear that they aren’t going to disappear, and while their strength is undeniably clear, there still remains so much room for growth. In combining education with the ever-evolving stories of their people, Māori can do so much more than survive: they can truly decolonize their minds. Thus, giving them the chance to become a truly sovereign people again, who see the world through the lens of an autonomous people, rather than a colonized one. This entry was posted in Our Experiences on August 31, 2017 by Danni. 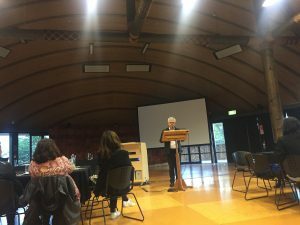 On Wednesday our group had the opportunity to participate in the first of a two-day conference workshop, held at Fale Pacifika, University of Auckland. Earlier in the week, each student signed up for one workshop to attend on Wednesday or Thursday. Students chose a conference workshop from a variety of topics ranging from Māori Storytelling to Socioeconomic Impacts of Māori People. Those of us that did not attended a Wednesday conference workshop began our day at 3:30 in the classroom. In class we created working definitions for two important terms: sovereignty and settler colonization. We discussed the controversial concept of native sovereignty and analyzed the vulnerability of certain types of sovereignty to colonizing forces. We defined the term settler colonization resulting in a comparison of settler versus extractive colonization. Similarities and differences between these two types of colonization highlighted the specific affects settler colonization has on the society and culture of native, rather then their resources. After wrapping up our class discussion we headed to an evening event with speakers Linda Tuhiwai Smith and Moana Jackson. Both speakers gave personal anecdotes to convey ideas of Māori representation and sovereignty. Jackson emphasized the act of drawing on old knowledge to create new ideas and described the importance of taking the past to enhance and shape the future. He stressed the need for confidence in communities to tell and share Māori identity, so outsiders don’t have the chance to superimpose their own perspectives and ideas onto Māori culture. Linda Tuhiwai Smith closed the workshop by sharing short poetic stories to explain what “drives” her as a person. Both speakers acknowledged everything the Māori people do as political because almost every Māori conflict falls back to the Treaty of Waitangi. Māori lives and struggles revolve on components of the Treaty such as land, rights and sense of space that connect back to Maori representation. This entry was posted in Our Experiences and tagged Aotearoa, Auckland, culture, representation on August 30, 2017 by camind. Today we visited Radio Waatea and the Auckland War Memorial Museum. 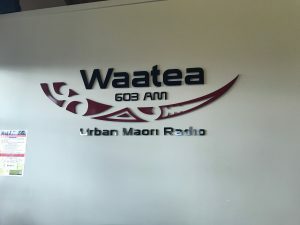 Radio Waatea is a radio station that broadcasts nearly only in Māori. The station is unique in the fact that it is situated within the Marae itself. 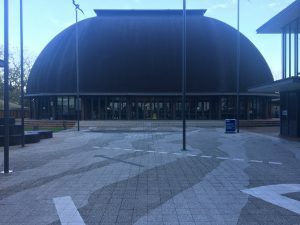 Moreover, the Auckland War Memorial Museum has many exhibits, including one that displays Māori art, weaponry, canoes and a beautiful, historic Marae. There is also a culture rich exhibit, which displays and dissects the Treaty of Waitangi. It was incredible to see the immense efforts taken to preserve Māori culture. We were invited into the Marae, where the radio station does their broadcasting. Broadcasting in Māori is culturally significant as it prevents the language from dying and makes Māori the mainstream. This is especially true with technology can disseminate information and reach a wider audience. While talking about preserving languages, one of the broadcasters said that “the language breathes if the environment allows for it”. I thought this was extremely insightful, because to encourage more Māori to speak their native language, there needs resources and spaces that make it possible. The radio station is doing exactly that. Following the radio station, we visited one of the classrooms. It was vibrant and full of artwork that the students had done. The students sang songs in Māori, which is another great example of creating an environment that allows for the language to breathe. For me, the visit to the radio station stood out the most. As stated previously, it is an urban Māori radio station located on the Marae. 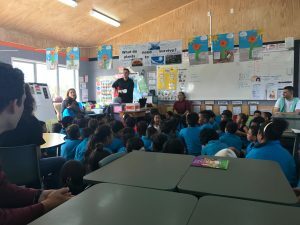 Even more however, the Marae works to help support their local community; there is a food bank, social workers on site, an elementary (primary) school, and a support system for people who are struggling. In targeting some social issues, the Marae provides the community with positive influences. Again, the Marae had me in awe. I was completely amazed to see that they had such a strong support system to sustain their people, their language and culture. Throughout time, Maori have been told how they can and cannot govern their people, resources, and land. Each opportunity for sovereignty has been met with limitation. However, in creating a space where Maori people can raise their kids, sustain their families, and live together as an Indigenous community, the people of the Waatea Marae have created a means for their own sovereignty and self-reliance. This entry was posted in Our Experiences and tagged Aotearoa, culture, Language, Marae, Waatea on August 29, 2017 by Eunice Lee. This entry was posted in Our Experiences on August 29, 2017 by jlreid. Kia ora! Talofa! Malo ni! My name is Aleila Melita Alefaio. I come from a family of Samoan and Tokelauan descent. I am a senior at the University of Washington studying Medical Anthropology & Global Health. I am currently president of the legacy group called Polynesian Student Alliance, which is an organization that serves to spread Polynesian culture awareness, voice the presence of an active and lively Pacific Islander community, and outreach and recruit Pacific Islander students for higher education. I am also part of a research group called Research Family made up of students of Oceanic background that uses their identities to connect with outside communities and decolonize cultural objects at the Burke Museum. I am a student researcher and assistant at Haborview Medical Center in the Global Health Department and Division of Medicine – Allergy & Infectious Disease Department. 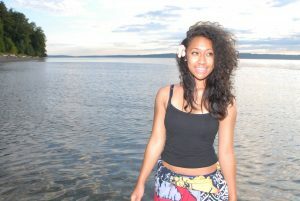 Much of my work involves intensive research and working with youth in the Pacific Islander community. I grew up in an affluent predominantly Caucasian area and found myself struggling with my identity. There was a constant battle between embracing my own culture and assimilating to the American culture. I was fortunate to find an empowering group of Pacific Islanders at the UW who helped me find who I was. This is my first study abroad trip — I found this trip to Aotearoa a perfect opportunity to learn more about my people, my brothers and sisters of Oceania, and myself. I also saw this trip as perfect opportunity to build a relationship between students at the University of Auckland and the University of Washington. With my field of study, leadership roles, and this trip to Aotearoa, I hope to project the voices of Pacific Islanders and empower future generations to reach for higher education while staying connected to the roots of our cultures. 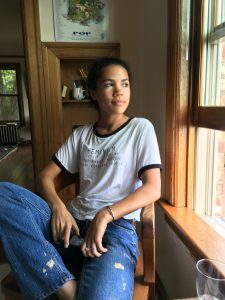 This entry was posted in Author Bios on August 28, 2017 by Aleila Alefaio. My name is Eunice Lee. Growing up, my family moved to a new country every few years. I am a Korean American born in California. 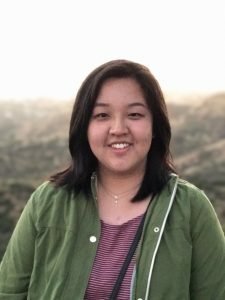 I have lived in New Zealand, the United Arab Emirates, China, and the Philippines; and am currently majoring in Environmental Studies at the University of Washington. My identity revolves around my upbringing, the culture and people of each country introduced new beliefs and perspectives that have shaped who I am. It has also influenced how I think and approach other people. 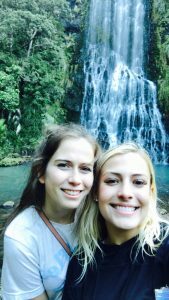 Having experienced multiple countries seems to make it easier for me to connect with and understand different people. The combination of the difference experiences from each country has added layers to my identity. My blogs will document some of my experiences here in New Zealand throughout the three weeks here. I lived in Christchurch from the ages of 4 to 8, so it has been thirteen years since I left the country. As a child, I saw New Zealand as a country with an abundance of grassland and nature. I’ve always felt a strong attachment to New Zealand and have felt intrigued and fascinated by Māori culture. I am extremely excited to be back and am looking forward to re-immersing myself into everything Aotearoa has to offer. Gaining insight and experiencing everything from a different perspective, I hope to learn in-depth about The Treaty of Waitangi, and how that impacts the Māori today in regards to land and the environment as it is a crucial element to Māori culture. As an Environmental Studies major, I am interested in laws and policies regarding land and water use. Moreover, by getting to talk to people and visiting different places, I aim to reflect on how colonization has shaped Māori identity and life. This entry was posted in Author Bios on August 28, 2017 by Eunice Lee. A Washington boy through and through, I was born in Kirkland, Washington into a loving family of four that would shortly turn into five (my younger brother would be born 3 years later). Originally from Kent I moved to Puyallup with my family at the age of five and we’ve called that our home ever since. After graduating from Governor John R. Rogers High School in 2014, I moved to Seattle to enroll into the University of Washington, following my older brother and father before me. My original plan was to pursue a degree from the College of Engineering, but as time progressed I realized that just wasn’t what I wanted. After my freshman year I switched my intended major to business and haven’t looked back since. With the focuses of marketing and entrepreneurship, I believe that I have finally found fields that are both engaging and challenging for me. 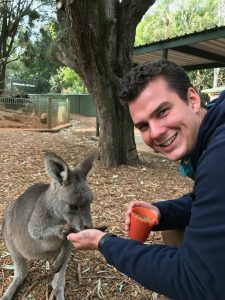 Me feeding a kangaroo while in Sydney, Australia before the program started. I can say with confidence that most of my fellow business majors wouldn’t be interested in a program like this, asking “Where’s the money in it?”, but that’s what makes me different. I strongly believe there is no better way to improve open-mindedness and prevent hate than with travel. Exposing one’s self to the world and its many cultures has a profound effect on any person, truly making them more tolerant and culturally-intelligent. Most of us can agree that in today’s world there are few people who need more cultural awareness than business people. It seems you can’t go a whole day without seeing news about a business doing something ignorant, and that’s where I hope I can make a difference. Throughout my college career, and throughout my life, I have tried to stay abreast on current and past social issues by taking courses and reading in my free time. When I saw this course on Sovereignty, Environment, and Representation in Aotearoa, I knew it was for me. This is just one more thing that can help me make the business world a better place. Whether we like it or not, businesses are here to stay and I hope that my experiences on this trip will help shape me into a future businessman that people will be proud of. This entry was posted in Author Bios and tagged AuthorBio on August 28, 2017 by dmc96. My name is Alberta Harvey, but most people know me as Birdie. I am a proud member of the Yakama Nation with my family stemming from Whitefoot Canyon. I am a part of a large, loving family of mixed backgrounds. Born a Seattleite, with a deep admiration for the land, I will always call the Pacific Northwest home. This September will be my second-year as a student at the University of Washington with goals to attain my Bachelors in Business Management/Human Resources from the Foster School of Business. I am enjoying being able to explore a wide range of discipline at the University as I am prepping myself for business school. Currently I am undecided on a specific career I would like to have post-graduation, but I am excited that my path is open for any opportunities that come my way. In my free time, you’ll find me outside with a book in hand. I am very connected to my local native community on and off campus. I also tend to work with (native and non-native) urban youth in various programs across Seattle. This trip to Aotearoa New Zealand is my first study aboard program. I have always desired to visit Oceania and have had a strong fascination with Maori Culture; I find Indigenous cultures endlessly intriguing. The second I heard about this trip through the American Indian Studies department I eagerly hopped on the opportunity. I aspire to learn how other indigenous people deal with the effects of colonization while implementing culture and environment revitalization. I want to learn about the similar and different perspectives on various issues, customs and ways of being. Having the privileged opportunity of exchanging knowledge and sharing experiences with the Maori peoples about Indigenous life is something I’m so honored to be a part of. I’m looking forward to sharing all my findings and experiences back home, with my campus and family communities. This entry was posted in Author Bios on August 28, 2017 by Birdie. Born and raised in Los Altos, California, I graduated in 2014 from Mountainview High School and will be a senior at the University of Oregon this fall. 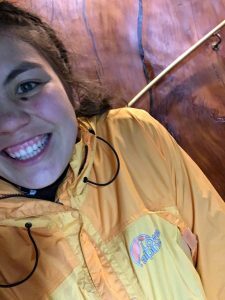 I am majoring in Environmental Studies and Geography with core focuses on Policy, Social Science, and Environment, Economy and Sustainability (EES). Additionally I am working towards minors in both Economics and Political Science. My studies at the University of Oregon have broadened my understanding of different perspectives associated with our world’s environment and resources from a social, economic, and political point of view. At the UO I am also a member of the Chi Omega sorority and get the chance to interact with a wide range of students, local nonprofit groups and kids to raise money and give back to the community. I recently became interested in political science to define and combat local issues and work with all types of communities to address specific problems that arise. Earlier this summer I worked as an intern in the Santa Clara County, researching ways city and county governments can uphold and support the Paris Climate Accord. At the end of my 10-week internship I produced a report containing policy recommendations I made after collaboration with government officials and local communities. My other past projects focused on the communication and information disconnect between minority groups, large corporations and governments, so I am looking forward to interacting with the native Māori people throughout our trip. This is my first studying abroad experience and the only time I have had the opportunity to travel outside of North America. I am looking forward to meeting and learning from the Māori people of New Zealand to explore how the environment influences native culture and practices. I am excited to study the Maori community’s history and traditions to add to my research and passion of addressing local and native issues that relate to the environment. This entry was posted in Author Bios on August 28, 2017 by camind.